In August, I plan on participating in two cloth diaper giveaway events. 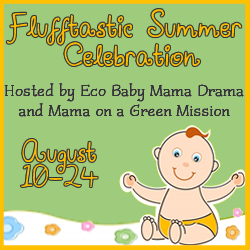 Flufftastic Summer Celebration runs from August 10 at 12:01 AM EST through 24 11:59 PM EST. There are currently 28 blogs signed up and each blog will have a cloth diaper related giveaway $30 or more. go to Eco Baby Mama Drama and sign up. Accessorize our Stash runs from August 24 at 12:01 AM EST though 31 at 11:59 PM EST. Each blog is required to have a prize package that is more than $15. There 30 blogs signed up to participate. go to So Easy Being Green and sign up.